MARCH 11th at 7 p.m.
Director Ed Wood’s 1959 masterpiece of poorly executed film-making -- PLAN 9 FROM OUTER SPACE -- slated for a national theatrical reissue, in color for the first time -- will commence a nationwide release following a gala re-premiere at San Francisco’s historic Castro Theatre on Saturday, March 11, 2006 at 7 p.m. It will be a wild red carpet affair with celebrity guests including stars from the movie scheduled to attend. Ed Wood’s unintentionally hilarious cult classic of aliens who attempt to conquer Earth by reanimating the dead has been hailed as the “worst movie ever made.” With string-powered flying saucers, laughable dialogue, shrewd alien logic and “priceless” special effects, the aliens’ invasion plan can’t go wrong. (Hint: It does.) The movie stars Bela Lugosi, who died after just two days on the set, Vampira, Tor Johnson and Dudley Manlove. Billed as THE ED WOOD FILM FESTIVAL - FEATURING PLAN 9 FROM OUTER SPACE, the screening will also include never-before-seen Ed Wood home movies (yes, see Ed model his famous angora sweater and fishnet stockings), rare Ed Wood commercials, THE LOST PLANS 1-8, narrated by Mystery Science Theater 3000’s Mike Nelson, and much more. Calabasas, California-based Holland Releasing distributes the film theatrically. The picture opens nationally next week. 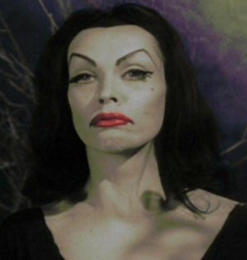 THE ED WOOD FILM FESTIVAL – FEATURING PLAN 9 FROM OUTER SPACE will continue at the Castro on Sunday, March 12th with screenings at 2, 4, 6 and 8 p.m.